Chicken Alfredo Pizza Rolls can be enjoyed for any meal. They are quick to make and easily customizable. 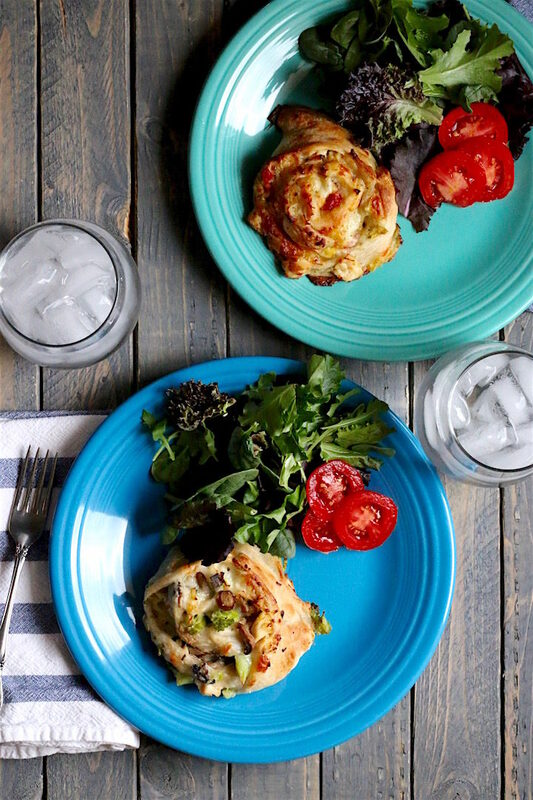 Want to get your kiddos involved in the dinner-making process? Chicken Alfredo Pizza Rolls are the key! Let them sprinkle the ingredients over the pizza dough. It is a great way to add in extra veggies. I served the Chicken Alfredo Pizza Rolls for dinner with a nice side salad to balance them out. Make your school night dinners hassle free with this quick and easy dinner. I have partnered with Baker’s (The Kroger Co.) the recipe, the photos, and the opinions are that of The Kitchenarium. All across the country school aged children are back to the daily grind of reading, writing, and math. Did you embrace the school year enthusiastically with plans to pack adorable bento lunches and have the perfectly meal planned dinners at night? My girls have been in school for a month now and I can say that all those enthusiastic plans have gone out the window. Dinners at my house are rushed between activities. It seems like cold lunches are just as quickly thrown together before rushing out to the bus in the mornings. The best part is the Pizza Rolls will help with both dinner and cold lunches. 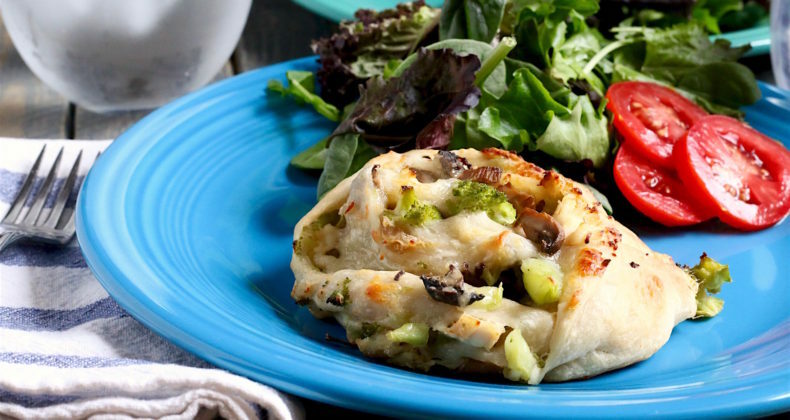 They come together in about 30 minutes, can be customized with your family’s favorite meats, cheeses, and vegetables, and they travel well -making them an ideal cold lunch entree. I took a few shortcuts and help from the grocery store in order to get these on the table so quickly. Two of the biggest time savers were grabbing a Rotisserie chicken from the Baker’s deli counter and a tube of ready to bake pizza crust in the refrigerated section (near the tubes of cinnamon rolls  ). This way there is no waiting around for dough to rise or chicken to cook. First, you pop open that tube of pizza dough. Next, spread the Alfredo sauce and add shredded chicken, cheese, and vegetables. Lastly roll the whole darn thing up and it will be ready to go in the oven before it has reached the proper temperature. Truly low stress! You can -and should- personalize these rolls. The variations are endless! Here is a basic formula to help you get started. Now go get creative! Our kids in the UK don’t go back to school until next week – but I think the back to school vibe is the same everywhere! Your Chicken Alfredo Pizza Rolls look delicious and very satisfying. My favourite is the Roasted Red Pepper and Artichoke version. 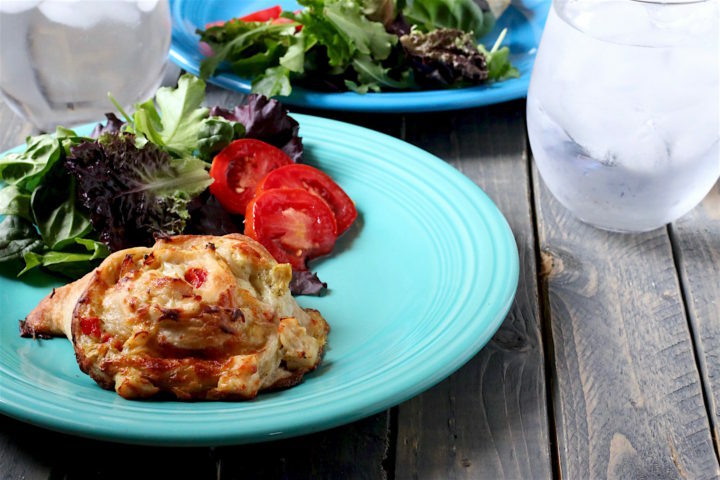 I thought the roasted red pepper + artichoke was the perfect grownup version of the rolls. Hope your kiddos have a great school year, April! Some really great ideas here! I love using shortcuts! I get a little help from my friends, at the grocery store 🙂 Shortcuts are what help keep me sane during this busy season. Wow-Im amazed at how easy these look! Yummy! Thanks, Mary! Super quick and easy -exactly what I need at the beginning of the school year.